Son of Philadelphia Police Inspector killed in FDR Park. Annie McCormick reports during Action News Mornings on April 1, 2019. SOUTH PHILADELPHIA (WPVI) -- The reward for information leading to the arrest of the person who murdered the son of a Philadelphia police chief inspector Saturday night in FDR Park has grown to $36,500. In addition to the city's standard $20,000 reward for homicide investigations, Philadelphia's Fraternal Order of Police is offering $10,000 for information leading to an arrest. Local Philadelphia defense attorney Joseph Kelly is offering another $1,000. Bill and Phoebe Henney have added $500. Twenty-year-old Nicholas Flacco was shot and killed around 10 p.m. on the 1400 block of Pattison Avenue. The suspect in the murder of the son of a Philadelphia police chief inspector may have been dared by the victim's friends to fire his weapon because they did not believe his gun was real, authorities said Monday. 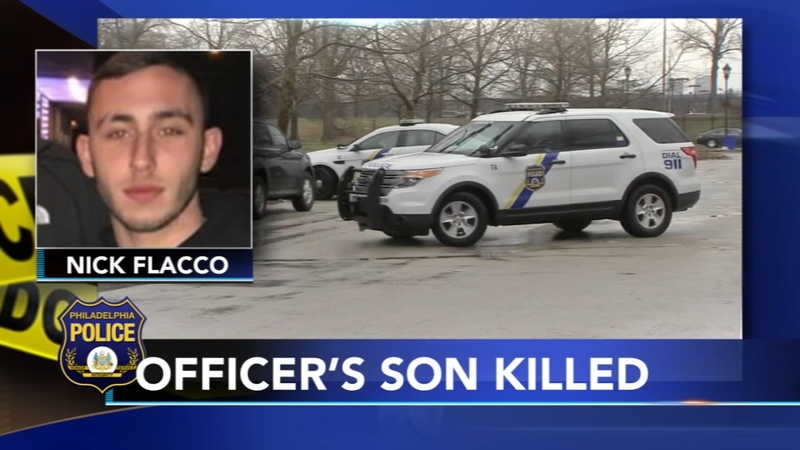 Nicholas Flacco's father Chris heads the Philadelphia Police Department's Internal Affairs Unit. A police source told Action News Flacco was home from Penn State University for the weekend to celebrate his birthday. The source said Flacco was tailgating with friends after the Phillies game had ended. Police said two groups of friends got into an argument in FDR Park, just off Pattison Avenue, and shots were fired. Flacco was hit in the chest and taken to Penn Presbyterian Medical Center where he was pronounced dead. According to police radio transmissions from the incident released Sunday: "There was a large group in the park here when this happened. They dispersed on Pattison toward Broad Street. A bunch of juveniles. A bystander out here apparently said there was a green car involved, older model sedan like a Honda. It went eastbound on Patterson after it left the park." Following the shooting, police officers, friends, and loved ones gathered at the hospital. Philadelphia Police Commissioner Richard Ross was seen leaving the hospital after consoling the victim's father. He spoke exclusively to Action News. "It does hit very close to home. I've known Chief Flacco for probably 25 years at least. Our hearts are broken and we're keeping him and his family in our thoughts and prayers. It's just another example of senseless violence," Commissioner Ross said. "We have no reason to believe at this juncture that Nicholas Flacco had anything to do with the fight. He was just along with some of the people there." On Sunday morning, officers were back at FDR Park investigating. Flacco was a student at Penn State University's main campus. He also attended Holy Ghost Prep in Bensalem Township. Philadelphia Mayor Jim Kenney issued the following statement Sunday afternoon: "I'm extremely saddened by the tragic death of Nicholas Flacco. Every life lost to violence is one too many. It is all the more tragic when we lose a young person who had their whole life ahead of them. I extend my deepest sympathies and condolences to Chief Inspector Flacco and his family, the Police Department, and all who have lost loved ones to senseless gun violence. PPD is undergoing a thorough investigation and I urge the public to come forward to report any tips that can help find the person who did this. The anonymous tip line is 215-686-TIPS."